As you can see, I’m two books strong into the new year (two books both started AND finished in the new year. gosh.). [If you would like more information on the rules (made up by Meghan – if you want to freestyle it, live your life! do what you want!) click here!] Mockingjay tore me to pieces. Someone asked for a post about that and LET ME TELL YOU, you will regret requesting that. My absence from this blog isn’t even excusable, really, other than I wrote so much here last year that I felt we both needed some time to ourselves. In order to (hopefully) satiate you lovely, wonderful, loyal readers for a while, please enjoy an excerpt from something I’ve been working on lately. I noticed she was nursing her right arm, and she went on to try to eat her breakfast with the spoon in her left hand. My words broke into the silence enveloping the table since Nalan had sat down. Ahna shot me a look – shocked? Confused? I didn’t know why. Nalan wasn’t responding to me; I assumed she didn’t hear me. Then I realized the silence that engulfed us was there because everyone had willed it to be there. No one was saying anything. No one wanted to say anything. And presumably Nalan didn’t want to hear anything, either. This sick feeling crept into my stomach as I realized Nalan had been pulling her hair out again. My words choked in my throat; I didn’t know what I was sorry for, I just knew I was sorry. Mik mouthed the words, “Shut up,” at me, as if she knew I would keep talking, even though I couldn’t figure out how to make my tongue small enough in my mouth for the words to skate by. Silence. Ten minutes of silence. No one told me what was wrong with Nalan. Not even after she left. Not when she came back reeking of vomit, her eyes puffy and red, scalp just the slightest bit barer. 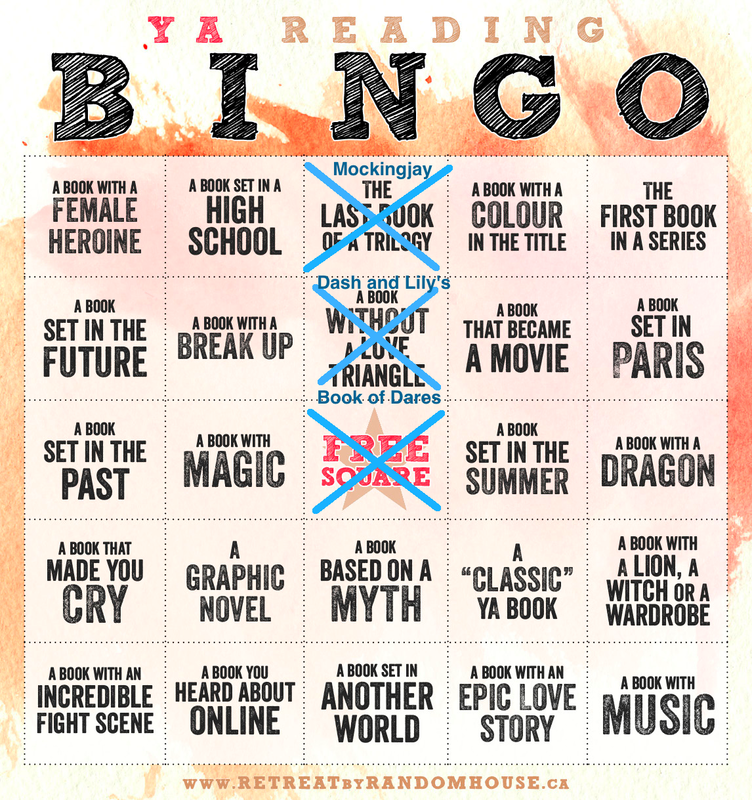 Tags: joy writes things, meghs book bingo, meghsbookbingo, reading bingo | Permalink. I just want you all to know that I took very careful consideration with each one of these songs. I listened to so many songs before compiling a list twice as long as this one, and then narrowed it down from there with each listen. My point is, you shouldn’t doubt my judgment because gosh I’ve spent an unnecessary amount of time doing this. It seems that Dead Poetic is an acquired taste, but I felt that this song was relevant. The feel of their music pairs well with angst, aggravation, and aggression. Although I listened to lots of DP songs trying to make sure I’d found the right one, Hostages felt right. Even though it lacks plot and drive, Brandon Rike’s vocals bring the heat. Okay, okay, I know you’ve stopped taking me seriously. To be fair, you probably stopped taking this list seriously once you saw Don’t Stop Believin’, but that is your own choice. Trust me! Don’t you remember my disclaimer? I know what I’m talking about. You’ve all seen movies, I’m sure, so you know that variety goes into a soundtrack. For me, this song brings renewal. It gives me the feeling of starting fresh, getting rid of all the old stuff you can’t (or don’t want to) deal with. Obviously, starting fresh is an important part of dealing with zombies. In my opinion, Juliet Simms’ voice should always be on the soundtrack of destruction. The way she destroys the notes is incredible. She has an amazing range and an amazing raspy-ness; she can do fantastic things with her voice. The rawness found in her singing is perfect, especially in the desperation heard here in My Goodbye. In my opinion, this song has worked its way into the category of classics, even though it’s not very old. If you hear this song and you don’t burst out singing, I can’t explain your actions. One thing I’ve realized, songs like this (and Don’t Stop Believin’, not to be tooting the horn again…) unify people in a weird, crazy way. I’ve met people by belting out songs like these in public. There’s just something about a passionate rock ballad that induces camaraderie and motivation. Of Monsters and Men have a very unique sound, in my opinion. Dirty Paws is especially unique because of the story it tells. Songs like this remind me of traveling, adventures, and sunrises. It’s soothing in a creepy way; it gives you the same pit in your stomach that you get when you know something horrible is about to happen. This song fits perfectly with the style of A Series of Unfortunate Events. Let’s be real, a zombie apocalypse is a pretty unfortunate event, at least to most people. Going back to the raspy-ness that is Juliet Simms, she is one-upped by the vocal style of Aaron Bruno. Sail blows all other Awolnation songs out of the water, and is one of my favorites for my exercise playlists. My point is, this is the kind of song that gets you in the mood and mindset to kick some decomposing zombie bottom. As we continue through the top five of this list, you can feel a sense of motivation and badassery flowing throughout these last four songs. Fall Out Boy came back from hiatus with a vengeance, and their new album is full of powerful tracks, like this one. The Phoenix is a song I proudly lip-sync to whenever I hear it, and the world suddenly transforms into my own version of Rocky. There is a definite possibility I could run up a thousand stairs if this song was playing, and that’s saying something. I didn’t include Radioactive on this list, so it was only right that I put Now in here. The passion and drive that accompanies Hayley’s voice is incredible. If it doesn’t give you a chill, or make you want to go punch a villain, then you have not listened to it enough. Now is a lot like The Phoenix – if I hear it in the car, I’m going to jam out like I’m Kristen Wiig’s character in Bridesmaids and I’m about to go destroy a giant cookie. This is one of my favorite mash-ups. These two songs are both powerful by themselves, but together form a mega-powerful song that is PERFECT for powerfully defeating thousands of zombies. It’s 12:35 at night and my eyes are starting to go fuzzy, otherwise I would have a lot more to say about this amazing song. It is inexplicably catchy and excellently blended. And, again, perfect for some zombie killing. Finally, a song that is actually about zombies. If you only listen to one song on this list, listen to this one. Ludo is one of the most underrated bands. Their Broken Bride EP is a story about time traveling and zombies so, seriously, how could you not adore them? It’s hard to explain this one song without the rest of the EP to back it up; it takes you through the gruesome part of the story. Save Our City epitomizes the drama, desperation and bravery that is the Broken Bride album. If I had to choose one song to play over and over as the soundtrack for the war against the zombies, this would definitely be it. Thank you for reading my ramblings, as always! I compiled this list for fun, and to spark your interests/conversation, not because I know anything about zombies or soundtracks or anything. I hope you enjoyed it, and I hope you listen to some of these songs. I’d love to read some of your favorite zombie songs – feel free to post them in the comments! Tags: automatic loveletter, awolnation, dead poetic, dirty paws, fall out boy, hot fuss, joy writes things, ludo, max bemis, max bemis and the painful splits, mr brightside, of monsters and men, panic! at the disco, sail, save our city, soundtracks, the killers, the phoenix, zombie apocalypse, zombies | Permalink. One thing I am absolutely good at doing is choosing the worst time to waste time, and that time is NOW. I realize I have been pretty absent lately. Check that, I’ve been completely absent. It’s been a nice solid break from writing, and I’ve finally started to miss it. I’ve recently decided to try to write a play (or rock opera. or something. I don’t really know what genre it falls under, but it’s going to incorporate ballad versions of rock songs [i.e. Seventy Times Seven by Brand New, or Mr. Brightside by The Killers] other than that, I have no leads or interesting info in my brain. I just want to do it in 2014), recently being about ten minutes ago, so I’ll be putting random bits of that up here. Feel free to nag me about it and keep me accountable. Tags: 2014, joy writes things, new year post | Permalink.